The mural in question in 2003. 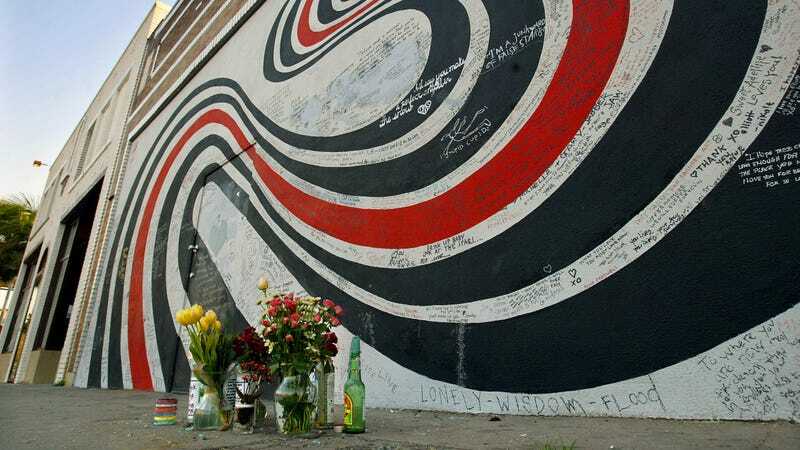 After Elliott Smith committed suicide in 2003, the mural featured on the cover of his 2002 album Figure 8 became an impromptu shrine, a place where fans could come together and mourn the shockingly violent death of the terminally sensitive singer-songwriter. For months, fans wrote messages to Smith on the wall of what was then an audio repair shop, leaving flowers and offerings in his memory. Now, another seemingly unstoppable force—the volatility of the nightlife industry—has come to claim Bar Angeles as well. Eater LA reports that the bar’s last day in business will be tomorrow, Saturday March 31, with the space being converted into a “modern Filipino cooking” spot called Ma’am Sir after that. There’s no word yet on whether the space’s new occupants will keep the mural, including the piece that Bar Angeles moved inside after excising it from the wall, intact.